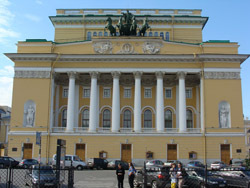 St. Petersburg's theatres are a celebration of beauty, refinement, good taste and accomplished professionalism. Outstanding stage design and costumes, powerfully acted performances, varied repertoires - this is what one can expect when visiting St. Petersburg's theatres. Theatre and concert tickets can be purchased at city box-offices. Performance begins: morning - 1130a.m., evening - 700p.m. Performance begins: afternoon - 1200p.m, evenings - 700p.m. Box-office opening hours: 1100a.m.-230p.m, 330p.m.-700p.m. Performance begins: morning - 1200a.m., evening - 700p.m. Box-office opening hours: 1100a.m.-200p.m, 300p.m.-700p.m. Box-office opening hours: 1100a.m.-300p.m, 400p.m.-700p.m. Performance begins: 700p.m. ; Small Stage Performances - 730p.m. Box-office opening hours: 1100a.m.-300p.m. ; 400p.m-700p.m. Box-office opening hours: 1100a.m.-300p.m., 400p.m.-700p.m. Performance begins: afternoon - 1200a.m., evening - 700p.m. Concert begins: afternoon - 300p.m., evening - 700p.m. Box-office opening hours: 200p.m-800p.m., 300p.m.-800p.m. Mon. Box-office opening hours: 1100p.m.-500p.m. ; Closed: Wed.
Concert begins: afternoon - 1200p.m., evening - 630p.m. Box-office opening hours: 1100a.m.-800p.m. ; Sun - 1100a.m.-700p.m. Concert begins: 700p.m., Sat, Sun - 600p.m.